I forget the name. 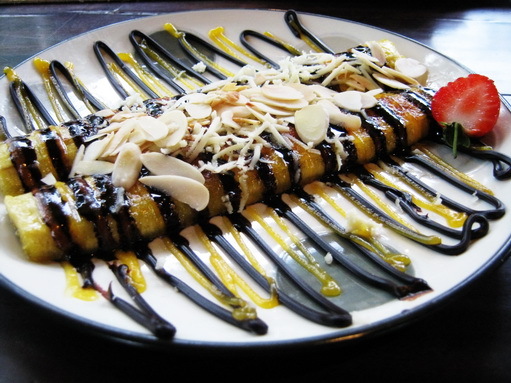 This banana is baked and added with chocolate and serikaya jam. Serikaya is a jam that made of eggs, sugar and coconut cream. Yummy! yummy indeed! hope you can visit my entry today. Looks like crepes, this is definitely delish. Sounds delicious and great macro photo ~thanks, namaste, A Creative Harbor ~ linked with Mellow Yellow Monday. Don't you just love to look at that kind and not ruin it? Lol.